Recently an old Soviet spy-identification aid has come to my attention. I don’t know if it’s authentic, but it looks, feels and reads as such. The surprising part is that according to this memo I would now be easily outed as a spy. Not because of quality work (god forbid! ), good posture and neat clothes, but mostly due to the habit of putting my feet up and love of cocktails. 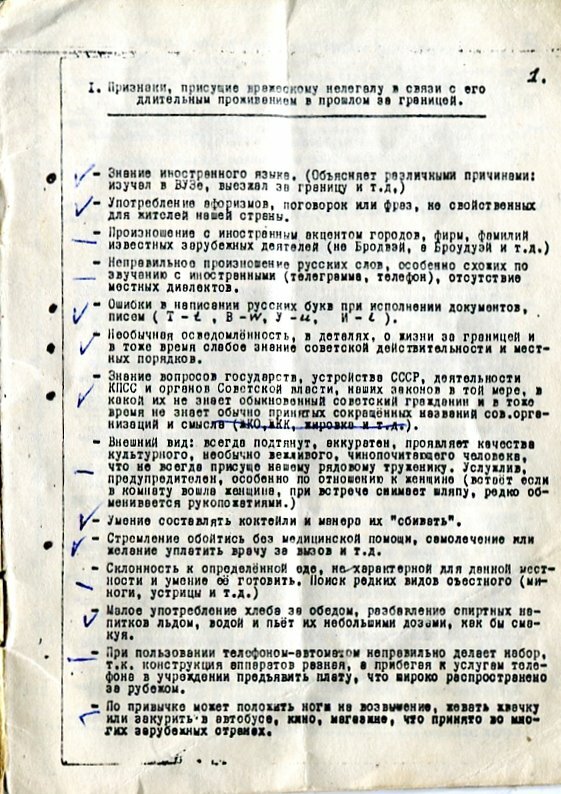 If you read carefully, the text is not of the highest opinion about an average Soviet citizen – a slouchy impolite slob, with simple food tastes, who eats a lot of bread, slams his drinks and has inferior work ethic. Usage of sayings, phrases and aphorisms unusual in our country. Incorrect pronunciation of Russian words, especially similar-sounding to foreign (telegraph, telephone); absence of local dialects. Incorrectly writing Russian letters while filling out paperwork and written documents (t-т, i-и, u-у, w-в). Unusually detailed knowledge of the life abroad and, at the same time, lacking information about the Soviet life and local customs. Extensive knowledge of the Soviet State, Communist Party and the Government above the level of an average Soviet citizen and, at the same time, unfamiliarity with common acronyms of the governmental organization names. Appearance: always demonstrates correct posture, neatly dressed, presents himself as cultured, unusually polite, subordinate person, on the levels unusual for the regular working person. Helpful, polite, especially to women (stands up when woman enters the room, takes off the hat, rarely shakes hands). Knows how to make cocktails and has a special manner to shake them. Avoids medical help, self-medicates, tries to pay for a doctor’s visit. Low consumption of bread during dinner, diluting alcoholic beverages with water and ice and sipping them, as if enjoying the taste. When using a telephone, dials incorrectly due to unfamiliarity with the model; tries to pay for using the phone in the office, which is common abroad. Habitually may rest his legs on high surfaces, chew gum or smoke on a bus, in a movie theater, store, which is common in many foreign countries. A habit to do only quality work (sloppy work will not satisfy a private employer). Unusual approach to solving production problems; specific professional terminology no used in our schools; using names and terms for parts and instruments that are used abroad. Returning traitors of the Motherland, immigrants, people lost during the war and anyone on their behalf. 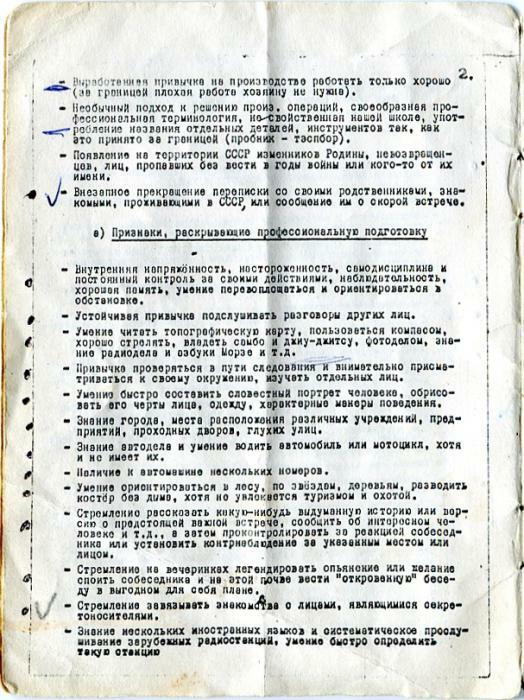 Sudden stop in correspondence with relatives and friends living in the USSR and promises to meet with them soon.